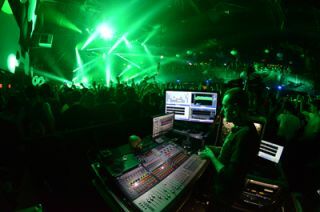 Video Equipment Rental (VER) Tour Sound has provided a Meyer Sound LEO linear large-scale sound reinforcement system for Bassnectar’s 2013 spring tour. This switch to LEO has given the electronic dance music (EDM) phenomenon’s shows a step up in power, clarity, and visceral impact. For most of the tour’s venues, the LEO system comprised dual main arrays of eight LEO-M line array loudspeakers, each with an underhang of four MICA line array loudspeakers. A massive setup of 24 1100-LFC low-frequency control elements delivered plenty of low end, while six JM-1P arrayable loudspeakers supplied front and corner fill as needed. The entire system was controlled by a Galileo Callisto loudspeaker management system with one Galileo AES master and four Galileo Callisto 616 array processors. Supply of VER’s LEO system was coordinated by Ralph Mastrangelo, director of business development at VER. Chad Fuller was systems tech; Whit Hawkins was monitoring engineer; and Carlos Donohue was tour manager. The system’s front end was anchored by an Avid VENUE SC48 digital console loaded with Waves plug-ins. For vocalizing, the artist employed a Sennheiser ew 500-935 G3 wireless system.